1. Preheat the oven to 200C/gas mark 6. Finely chop or crush the garlic. To make the marinade; in a bowl, combine the cumin, the garlic, half of the oregano and 1 tbsp olive oil. Season with sea salt and black pepper. 2. Place the diced lamb in the bowl with the marinade, mix well and leave for 10 mins. 3. Meanwhile, peel and dice the sweet potato into 1cm cubes. Toss with 1 tsp oil, the remaining oregano and place on a baking tray in the oven for 15-20 mins, turning halfway through. 4. Thread the lamb in equal amounts on each skewer. 5. Preheat a griddle pan (or frying pan) to a medium-high heat, cook the skewers for 10-15 mins, turning every 2-3 mins until all sides are golden brown and cooked through. 6. To make the Greek-style salad; dice the cucumber and tomatoes, halve the black olives and finely slice the mint. Place all these ingredients in a bowl with 2 tsp olive oil, the white wine vinegar and season with sea salt and black pepper. 7. 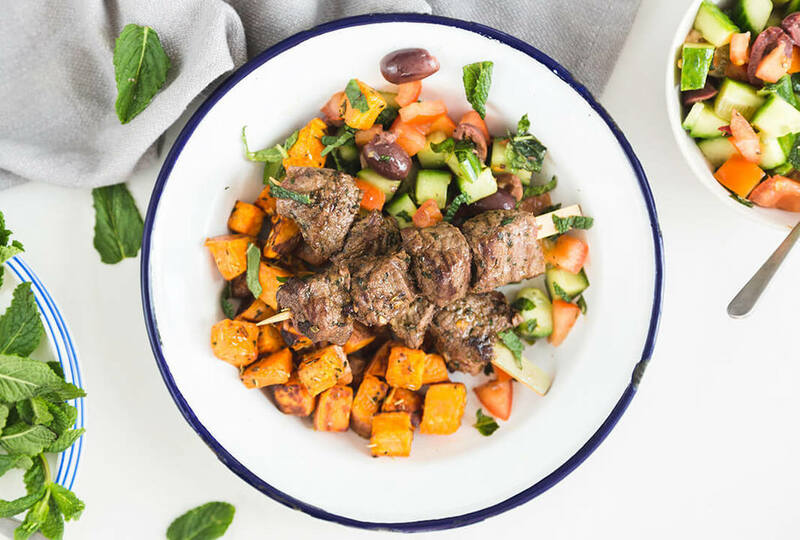 Spoon the Greek-style salad onto two plates alongside the roasted sweet potato and top with the lamb skewers.